Ever since mankind developed consciousness, there have been unanswerable questions asked about where that consciousness goes after we die. Plato believed that death was the release of the soul, while the comparative anatomist Thomas Henry Huxley posited that death of the body necessarily meant death of consciousness. Then there are those like my neighbour, who believes that the consciousness of a dead person just sort of hangs around, being a nuisance. Moving cups and turning the television off at the good bits of films. Slamming doors. Basically spectral moody teenagers, that's what my neighbour thinks we become when we die. 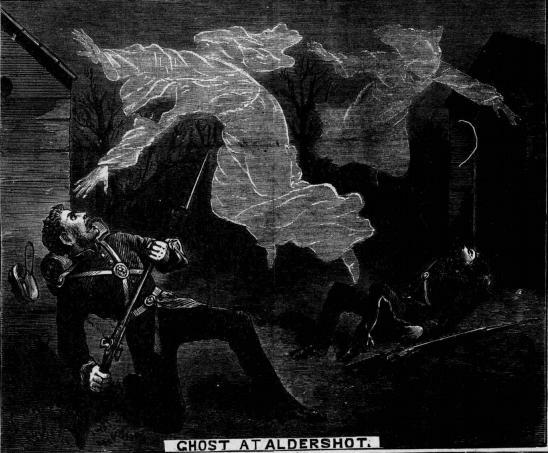 If ghost stories are pervasive now, the Victorians were at saturation point. Cheap printing, cramped cities with exploding populations (not literally, that would be terrifying) and myriad other factors contributed to the Victorians consuming ghost stories faster than they consumed soot. 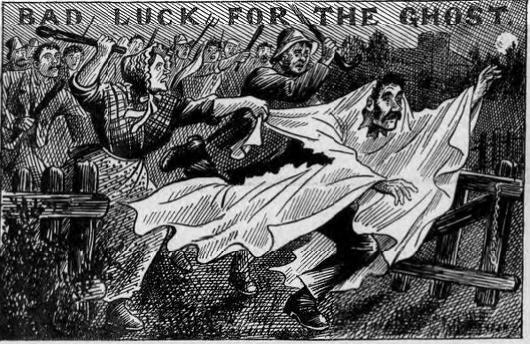 I've had a look through everyone's favourite penny dreadful, the Illustrated Police News, for some ghoulish japes from a bygone age. 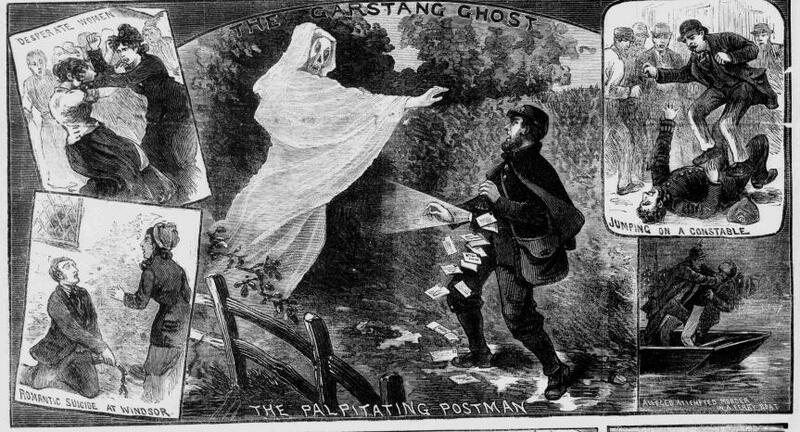 To Garstang and a ghost that inexplicably wishes to prevent a postman from doing his job. 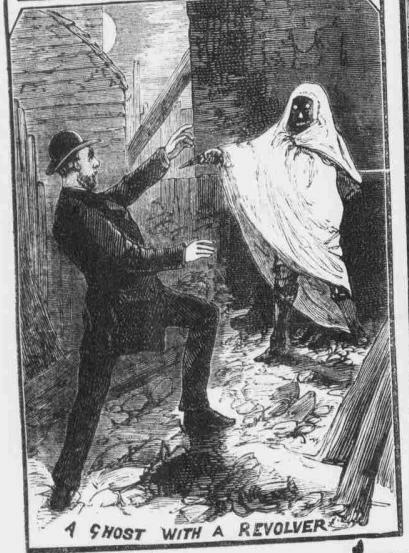 The ghost in this illustration has a skull's face but a hand covered in skin, so is either wearing a horrible mask or a horrible glove. 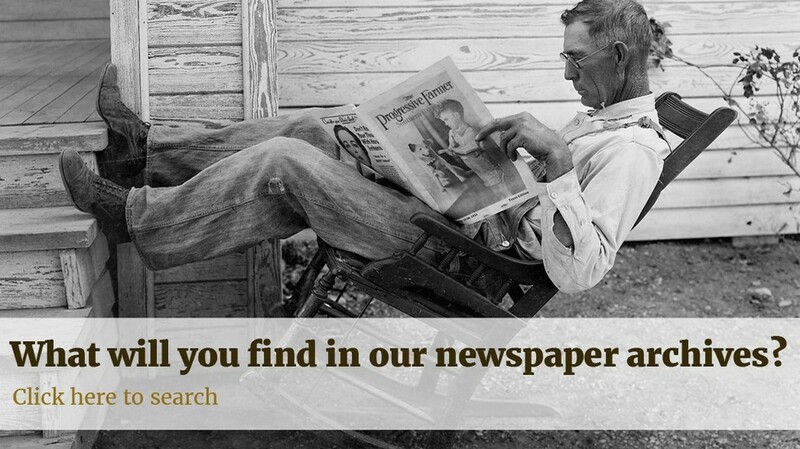 The surrounding articles aren't related, by the way. They're just quite funny. No use fixing bayonets, lads. They're ghosts. That's a bloke in a sheet being assaulted. Possibly trick or treat related. How do you make a ghost even more scary? Literally give it a gun. Don't ask questions about how it can hold or operate the gun, or its motivation to do so, just give an actual revolver to a ghost. Which One is the Ghost? Either this is satire, or no one in this image is a ghost. 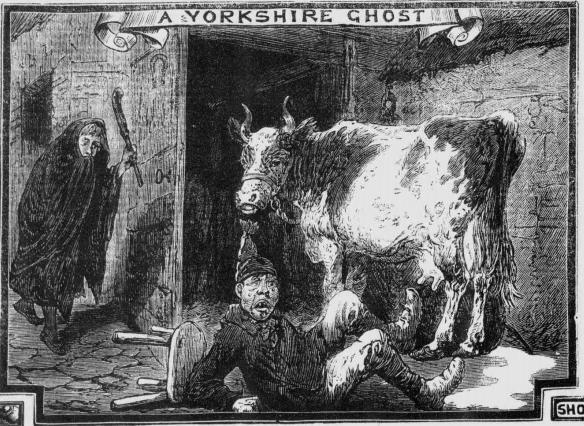 Unless that's a ghost cow – and let's not rule anything out – this illustration has two people and their bovine chum. One thing is clear, however, and that's the opinion of this illustrator on the aesthetics of Yorkshire folks' faces.